Located off on I-71 North, you will find the beautiful subdivision known as GlenEagles Estates. Homes in GlenEagles Estates began to be developed in the early 1990s to the 2000s. The price range of this neighborhood is $250,000-$550,000. Typically, the square feet of homes in this neighborhood ranges between 2500 and 6000. Generally, most homes in this subdivision are all brick. At the same time, GlenEagles Estates is not the type of subdivision where every home looks the same. You will notice that the color of brick and overall style of home varies from home to home. Some homes even have a porch on the front of the home. The Hollinden Team updates this search for GlenEagles Estates homes on a daily basis from the Louisville MLS. Click the map to the left to view each home for sale in GlenEagles Estates. There is a satellite view button in upper right. Gleneagles Estates is conveniently located near shopping and restaurants. You will never have to travel far to go to the grocery because Walmart is only one mile away and Kroger is less than a minute away. A few close by restaurants to GlenEagles Estates are One Nineteen West Main, Bully Barbecue, Raw Sushi Bar and Grill, and Serendipity Café and Gifts. At The Paddock Shops, you can find various stores such as Gap, Barnes and Noble, Ulta Beauty, DSW, and Bed Bath and Beyond. The Paddock Shops offers several restaurants such as Stoney River Steakhouse and Grill, Noodles and Company, Mitchell’s Fish Market, and Five Guys Burgers & Fries. If you are a golfer, you are in luck. 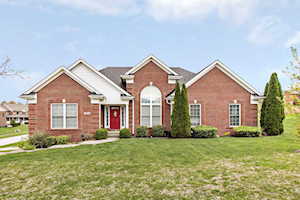 GlenEagles Estates is close to several golf courses including Eagle Creek, Oldham County Country Club, Sleepy Hollow, Nevel Meade, and GlenOaks. This neighborhood is located in the Oldham County school district. This particular district is one of the best in the state of Kentucky. The home elementary school for GlenEagles Estates is Locust Grove Elementary. The home middle school is East Oldham Middle School. The home high school is Oldham County High School. If you would like to learn more or have any questions about any of these GlenEagles Estates houses for sale, or others in the zip code 40031, just click the "Request More Information" button on any property detail page. The REALTORS at the Hollinden Team can provide you with past sale information, comparables, disclosures, PVA assessment, and tax information – we would love to answer any real estate questions you have.